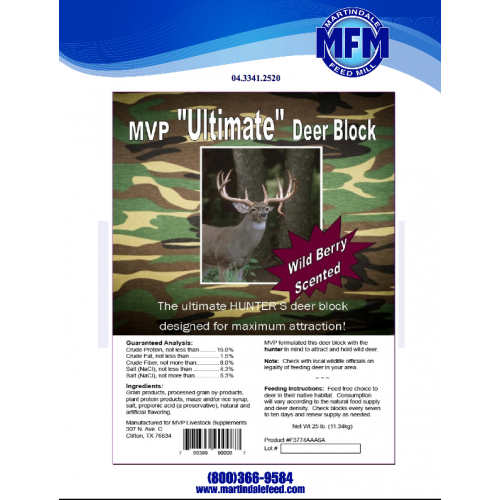 Ultimate Hunters deer block designed for maximum attraction. NOTE: check with local wildlife officials on legality of feeding deer in your area. INGREDIENTS: Grain products, processed grain by-products, plant protein products, maize and/or rice syrup, salt, propionic acid, natural and artificial flavoring. FEEDING DIRECTIONS Feed free choice to deer in their native habitat. Consumption will vary according to the natural food supply and deer density. Check blocks every seven to ten days and renew supply as needed. 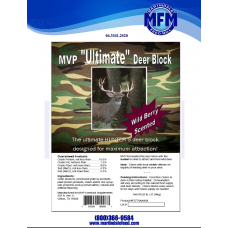 Manufactured for MVP Livestock Supplements.